A public transit station Flag snaps against an Autumn sky above bustling city traffic with the “King and Queen” towers of the north Atlanta skyline in the distance. To take reference photos of this scene, I had to wait for the light to turn red, and then stand in the lanes of oncoming traffic. Framing the shots while keeping one eye on the signal kept me so occupied that I didn’t notice the bus going by until I reviewed the finished photos. It turned out to be the element that ties all of the others in the painting together. Categories: Landscapes, Notecards. 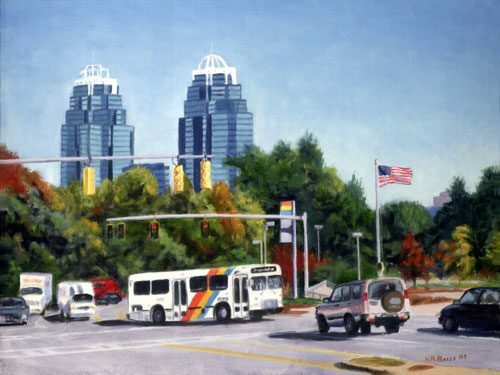 Tags: art note cards and postcards featuring local and regional themes, Atlanta landscape, Atlanta landscape painting, Atlanta Landscape Prints, Doubletree Towers Atlanta, Flag art, Flag painting, Flag print, Floral Art for Sale Online: fine art prints, Georgia art, Kathleen Bates, King and Queen Atlanta, Marta Bus, Marta Station, Southern art, Southern Artist, Southern landscapes. 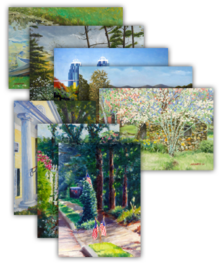 8 Assorted Cards options: 5″ x 7″ Notecards with Envelopes – 4″ x 6″ Postcards. Notecards come with premium white envelopes. Postcards are printed on recycled paper with a matte finish. 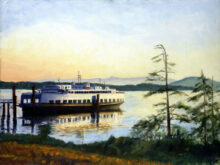 Early morning light creates an air of stillness and serenity in a classic Pacific northwest scene. 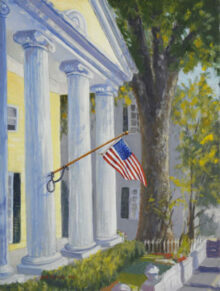 A flag displayed on a grand, old Greek Revival home creates an iconic image. I must have been drawn to this scene because it looks so much like Georgia, but the setting is actually the tiny town of Rensselaerville, New York. 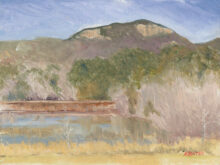 A rugged landscape wears the changing seasons with grace. According to local Indian lore this flat-topped mountain was the place where God came to dine.